Did you hear that there is a shortage of conversation hearts this year for Valentine’s Day? Those chalky but sweet hearts with cute sayings are unavailable due to a candy company change of ownership. These hearts are so iconic, that it made me think of other things I miss from Valentine’s Day past. Mailboxes made out of shoeboxes for the class party. Remember bringing in a shoebox to decorate for the Valentine’s Day party when you were in elementary school? After you decorated it with construction paper, you cut a slit in the box top and your classmates dropped your Valentines inside. My kids only ever decorated paper bags for their class Valentine’s. Boo! Where’s the fun in that? The way my son used to call it ValenTIME’s Day. Okay, so you’re rolling your eyes because you weren’t around to ever hear it. But trust me, it was cute, my preschooler saying “ValenTIME’s Day”. I miss when my husband and I were young and innocent and actually got gifts for each other. Nowadays, I get the gift of hearing from my husband for the 2 weeks leading up to Valentine’s Day say how it’s invented by the card companies and how overpriced it is. Ha! I can’t believe I’m about to say this…BUT now that my kids are older, there are no more Valentines to make. Sniff! Remember how cute they were? And how neat it was to attach a lollipop or sticker to each one? Yes, I’m blocking out the three weeks that it took to make Valentines back when my daughter was in kindergarten. I totally have my rose-colored glasses on! 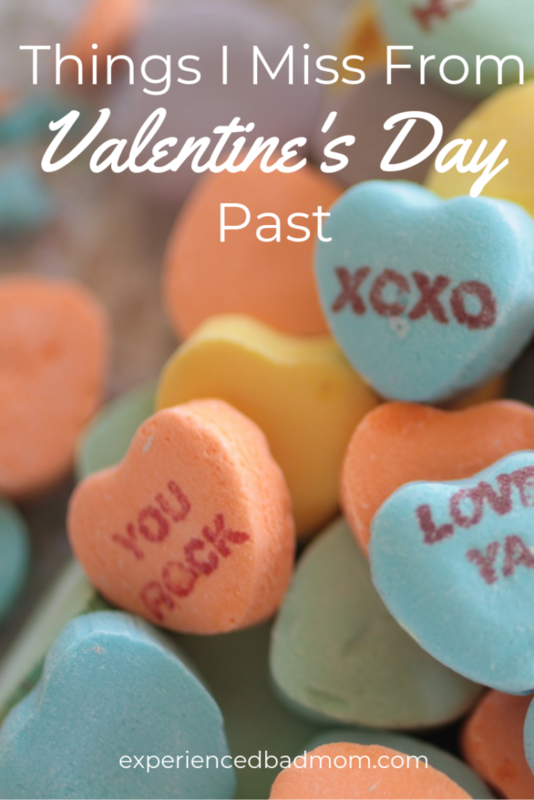 What’s your favorite thing about Valentine’s Day in the past? I miss arriving at preschool on ValentiMes Day to pick up my son and being treated to his swollen, firey-red face … Turns out he’s allergic to red dye. Who knew? Oh, Kelly, I’m sorry to laugh. That makes me a bad mom/person. But really?! Do share the tale on your blog one day. I miss the Sweethearts too. Such fond memories. I had forgotten about the shoeboxes. Someone told me another brand has the conversation hearts available this year. I’ll have to look out for them. Wishing you a Happy Valentine’s and Galentine’s Day, sweet friend! Happy Val/Galentine’s Day to you, too! I applaud you for getting the Valentines on sale last year–good job! Yep, you really are blocking out the memory of the three weeks it took to make them. We still have 5 more to go for the Kindergartner. So close!